Before you enjoy a fun afternoon on the New York waters, see our complete list of New York state marinas. 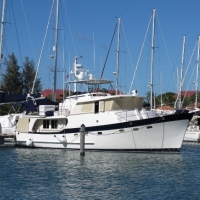 Find out about different types of marinas in New York and the services they offer. 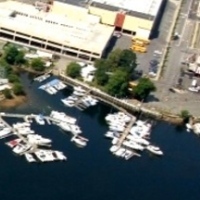 See detailed reviews on all of the NY marinas. One of the full-service marinas in New York; Gateway Marina offers 500 slips, 1800' of breakwater, a 35-ton travel-lift, 24-hour security, a picnic area with barbecues, restroom and shower facilities, and transient dockage. The marina even offers mount services for the winter, so that your boat won't get damaged by ice. The marina is easily accessible from parts of Long Island, Manhattan, Queens, Bronx, and New Jersey. Check the website to keep updated on wind and tide information. One of the Most Beautiful NY Marinas! 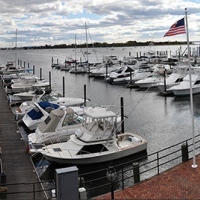 Located in a sheltered harbor just 35 minutes from Manhattan; the Manhasset Bay Marina is a large, well-mainted 300-slip facility with modern floating docks and pedestal electric hookups. Amenities include fuel, ice, a modern shower, bathroom and laundry facilities, free wi-fi, and 24-hour security. Overlooking the marina is LaMotta's Waterside Restaurant, which serves some of the best continental cuisine you'll ever taste! The restaurant offers both indoor and outdoor dining for lunch, dinner, and Sunday brunch. Local attractions in the area include shopping, golf, tennis, pool, a multiplex movie theater, Willet's House Museum, and the Science Museum of Long Island. Your Gateway to the Big Apple! One of the most beautiful yacht marinas in NY, North Cove is frequently referred to as "Monaco on the Hudson." The 12-slip marina caters to mega yachts. You'll also find slips for historic vessels and smaller boats. As long as the space is available, your boat is more than welcome. With North Cove being a gateway to the Big Apple, you can use the marina to entertain clients and hold business meetings. Or you can park your boat as you enjoy the best NY restaurants, shopping, art museums, and Broadway shows. Check the website to keep updated on discounts on private yacht dockage. Topnotch Marina Services in New York! Only 15 minutes from the Verrazano Bridge and Sandy Hook by water; Atlantis is a full-service marina with floating docks that accommodate 140 boats ranging from 18-100 feet, a 38-ton travel lift, 2 full-time mechanics on staff, and a holding tank pump out station for your convenience. 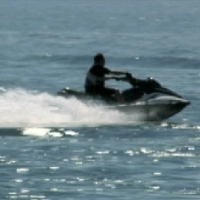 You'll also find 30 flotations slips, available for personal watercraft. Additional services include a marine supply store, yearly slip rentals, boat and water sport repairs, storage, hauling, and mooring. If you're looking for someplace to celebrate your next special occasion, Atlantis' party affiliates will help you host a party to remember on the gorgeous marina! 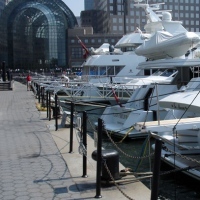 Boat Storage and Rentals in New York! The Bayside Marina in NY offers daily fishing and boating rentals, seasonal dock space and mooring rentals, kayak storage, and 24/7 launch service from May 1st through October 31st. The facilities are handicap accessible and include a full-service snack bar where you can help yourself to breakfast items, hot dogs, burgers, French fries, soda, beer, and much more. Public parking is available every Monday through Friday until 3 P.M., excluding holidays. If you have any questions about the marina or would like to store your boat for the upcoming season, call 718-229-0097 or send an e-mail to info@baysidemarinany.com. Since slips are limited, be sure to reserve them as soon as possible. Off-Season Boat Storage and Marine Services in NY! Established in 1971, Albany Marine Service has been committed to excellence for over 40 years. The staff understands that when you own a boat, you want to protect and care for it in the best way possible. That's why Albany offers such services as mechanical and fiberglass repairs. The full-service boat yard and marina includes an in-out travel lift, a launch ramp service, and off-season storage. In-yard services include recommissioning, launch and tie-up, winterizing engines, shrinkwrap, engine oil change, winterizing water systems, winter storage, haul and block, bottom wash, hull cleaning, and battery care. 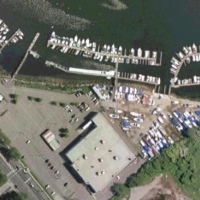 A NY Marina with Year Round Access! A full-service New York marina and boatyard, Harbor Marina gives boaters unparalleled waterfront access all year round. The facilities include over 90 slips on floating docks with finger piers, electrical outlets, a shoreside restroom, and shower facilities. The ship's store is well-stocked with marine parts and accessories, snacks, bait, ice, tackle, sundries, boating and local literature, and customized nautical gifts. The marina's restaurant serves lunch and dinner throughout the entire boating season, and offers spectacular sunset views. Only a short ride away, visitors can enjoy fine ocean beaches, retail shops, historical landmarks, museums, theaters, art galleries, restaurants, and night clubs. Enjoy the East Hampton Sunset! A peaceful location for enjoying an evening on your yacht, Halsey's Marina contains 41 slips that accommodates vessels from 40' to 105'. 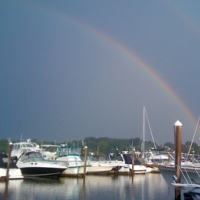 The marina is also a great place to hang out with friends or watch the East Hampton sunset. Amenities include individual water, electrical services, cable TV, broadband, and phone hook-ups. Plus, every customer has a personalized parking spot! The marina's clubhouse includes restrooms, showers, beverages, ice, and a spot to relax. The New York marina is a short drive from some of the finest beaches; as well as art galleries, restaurants, and retail stores in the region. If you need repairs, all you need to do is contact the administrative offices at 631-324-5666 (ext. 104). Park your Boat near East Hampton Village! Gardiner's Marina offers generous vessel accommodations near East Hampton's Historic Village. The NY marina is a great place for soaking in the sunset, hanging out with friends, or simply enjoying a peaceful night on your boat. Plus, as a customer, you get access to your very own parking space right behind your boat! Loading supplies and materials onto your vessel will be a walk in the park. In the nearby vicinity you'll find the world's finest ocean beaches, restaurants, art galleries, and retail stores. If you don't own a car, there is a series of transportation choices available--like taxis, public shuttle buses, and car rentals. In the event that you're in need of repairs, simply call the administrative office at 631-324-5666 (ext. 104). One of the Nicest Marinas NY State has to Offer! 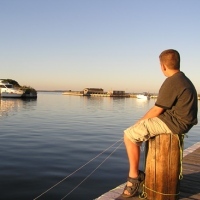 Located in New York's beautiful Finger Lakes region, Hibiscus Harbor is one of the finest marinas in the area! The facilities include 200 seasonal boat slips, 50 transient boat slips, a boat launching site, parking permits, electrical hook-ups, picnic areas, cable TV hook-ups, pay telephones, and hot showers. Open 7 days a week is a fuel dock that offers gasoline and diesel. Seasonal slips are available, from April 1st through September 30th of each year. 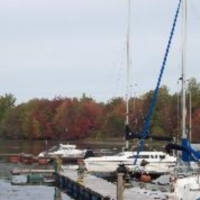 The marina is accessible to the New York State barge canal and Seneca Lake. Grab a meal or some drinks at The Wheelhouse, a full-service restaurant and bar on premises, with an outside deck that contains a Tiki bar. Area activities include an in-ground swimming pool and tennis. Park Vessels up to 150 Feet in Length! A naturally sheltered, deep water cove; Haverstraw Marina ensures its visitors worry-free navigation with an average depth of 24 feet. 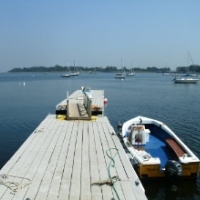 All modern floating docks come equipped with water, shore power, and cable and phone outlets. Vessels up to 150 feet in length can fit in one of the stationary docks. The fuel dock and launch ramp are open all year round, with free pump-out services. Additional amenities include an Olympic-sized pool, cabanas, a sauna, picnic areas, horseshoe pits, showers, laundry, a playground, a video arcade, wi-fi, a convenience store, a canvas shop, sail repair, and full service for power and sail boats. Located nearby is the Hudson Water Club, a beautiful waterside restaurant that offers sweeping views of the Hudson River. 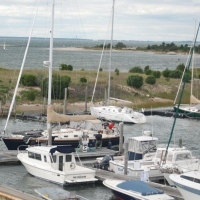 One of the Most Affordable Marinas NY has to Offer! Hidden in the rolling hills of the Alleganies is Onoville Marina--one of the best kept secrets in New York State! 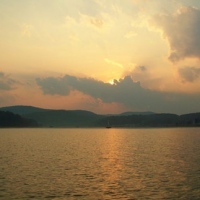 The NY marina is just north of Allegany National Forest and west of Allegany State Park. In the area you'll find bald eagles and osprey soaring high over the pristine waters. 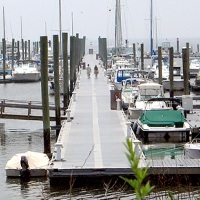 The marina contains 8 piers of docks that can fit approximately 400 boats up to 44 feet in length. One of the most affordable marinas New York State has to offer, Onoville usually opens on the first Friday of May. The closing date is often contingent upon late summer water levels. The facility is staffed 24/7 during operating season, so security problems will be minimal. Amenities include laundry and coin-operated showers. Enjoy Great Views and Outdoor Fun! Located at the north end of Greenwood Lake in New York; Willow Point's full-service marina offers 150 slips with summer and winter storage, a gas dock, a full-time mechanic, a snack shack, bathrooms, and showers. Open year round, the marina is considered to have one of the best panoramic lake and mountain views in the area, along with large park-like grounds. 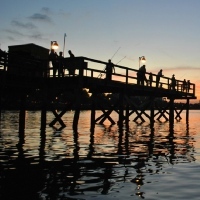 Whether you enjoy boating, water skiing, jet skiing, fishing, swimming, diving, or other fun outdoor activities--the Willow Point Marina is fun for the entire family! Browse the website for a list of hotels, restaurants, and entertainment venues in the area. One of the Safest Marinas in NY! 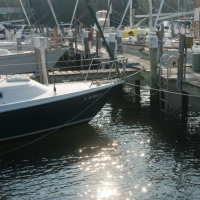 Offering safe and protective docking at affordable prices since 1987, B & B is one of the nicer marinas in New York State. Features include restrooms with showers, laundry, free pump-out for seasonal customers, a picnic area, water and electricity, and a certified marine mechanic. Plus, the owner lives on the premises. Browse the website for seasonal, monthly, weekly, and overnight dock fees; as well as prices for winter and summer storage. If you want to contact the marina between May 1st and October 15th, the phone number is 518-298-4259. During the rest of the season, the contact number is 450-969-4576. For international visitors, the staff is bilingual in both English and French. Park your Boat, Have a Drink, and Enjoy Good Food! 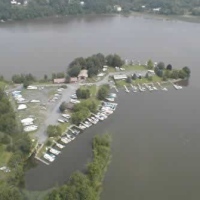 A bar, grill, and marina in New York; Tamaqua has been in business for over 70 years. The waterfront bar and dining facilities are open year round. Stop by and taste one of Chef Benny's delicious daily specials! The kitchen is open from 12-8 P.M. on Tuesdays, Wednesdays, Thursdays, and Sundays; and from 12-10 P.M. on Fridays and Saturdays. Knock back some drinks and show off your incredible pipes at karaoke every Saturday night! Commercial fishing and diving boats are available for rental. The gas dock is open daily from 8 A.M. to 5 P.M. Check the website regularly to keep updated on shark and fishing tournaments at the marina. Dockage for Boats, Jet Skis, and PWC's in NY! Offering 120 wet slips for boats up to 40 feet in length, Venice Marina is your premier docking destination in New York. On site you'll also find plenty of dockage for personal watercrafts (PWC's) and jet skis. The full-service boatyard is equipped with a 35-ton travel lift. The 2,400-square-foot ship's store is fully stocked with over $300,000.00 of quality inventory! Catch a movie at the multiplex across the street and/or grab a bite to eat at Clemente's Crab House, a popular waterfront restaurant. Plus, the marina is only a 15-minute drive from Coney Island! Check the website for dockage and storage fees on boats, jet skis, and kayaks. A Conveniently Located Marina in New York! 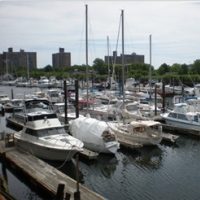 A convenient marina for yachtsman, fishermen, and sailors alike; the Marine Basin Marina has been serving NYC's five boroughs and New Jersey boaters for over 40 years! On the basin you'll find over 200 floating private and semi-private slips. 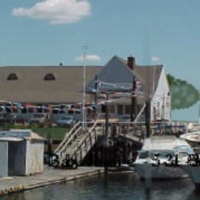 The full-service New York marina offers such amenities as mechanical services, hauling facilities, 30- and 50-amp electrical service, water at every slip; a fuel dock with gas, diesel, ice, and bait; marine supplies, and 24-hour security. Plus, you'll be near such attractions as Coney Island and the New York Aquarium! Transportation-wise, the marina is only minutes from the Verrazano Bridge as well as NYC trains and buses. A Full-Service NY Marina in Jamaica Bay! A full-service marina in Jamaica Bay, Sea Travelers Marina is conveniently located right off the Belt Parkway (Exit 11N). Amenities include 300 slips, private slips, a 35-ton travel lift, 24-hour security, jet ski dockage and service, a parking lot, new and used boats, new and used trailers, bait, tackle, beer, soda, ice, and snacks. Other services include a gas dock, a canvas shop, complete winterization, emergency hauls, bottom painting, fiberglass, interior/exterior detailing, and shrink wrap. If you need any additional information, contact Mike Bulzomi at seatravelers1@aol.com. You can also call 718-377-0216 or 718-338-6054, or send a fax to 718-338-6336. Top Quality Marina Services in New York! Located on New York's beautiful City Island, Barron's Marine was first established as a rowboat rental service in 1934. Over the following 70 years, it was expanded to include a two-acre marine facility and dry-dock. The full range of marine services (i.e. : fiberglass repair, wooden boat restoration, gel-coat restoration, paint jobs, winter storage, mooring) utilizes some of the most advanced technology in the boating industry. Barron's professionally trained staff possesses years and years of experience, and will always find the quickest and most effective ways to take care of your needs. Because of the excellent quality of service, the marina in NY has generated more than a fair share of satisfied customers. A Fun, Relaxing New York Marina! 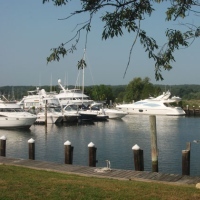 One of the most beautiful marinas in New York, Watch Hill allows you to enjoy the comfort of your own boat while being steps away from all the exciting attractions the area has to offer. The marina offers slips with optional water and electricity. Power adapters are available for rent in the store. Most slips are available on a first-come, first-serve basis--though reservations can be made for 75% of the slips on site. Check out time is 10 A.M. everyday. The marine's boating season often runs from May through October. Area activities include swimming, back-country hiking, and bird watching. Feel free to grab some food at the snack bar or a drink at the Tiki bar.